All our atv 4wheeler trails are open and ready for Spring. 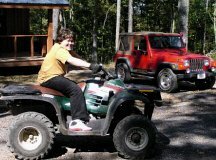 Your kids can enjoy a safe four-wheeling adventure while you relax on your cabin's big screened porch. Pack up your 4X4 and join us in a private outdoor getaway before hot weather comes to Buffalo River country. From April 10 to June 15, 2007 your whole family (children, adults, AND pets) gets a FREE night's lodging when you stay a week in any of our spacious cabins. Stay 6 nights with us and get your 7th night completely FREE. Baxter County Master Gardeners Annual Seminar. The Ozark Mountains of Northwest Arkansas and Southwest Missouri can be challenging for folks who want to grow healthy vegetables, beautiful flowers, and year-round lawns. The tips these Master Gardeners offer will be especially helpful for folks relocating or retiring to the region. Guest speakers, horticulture display tables and exhibits, horticultural information geared for ALL ages. Hours 8:30 a.m. to 3 p.m. Registration required by March 3, 2007. Then return to Bear Creek Log Cabins for a good night sleep and a beautiful sunrise from your cabin porch. Admission: $12 adults, $6 ages 12 and under. or e-mail tina@clearspringschool.org for more information. Then CONTACT Libby to stay in our comfortable log cabins while you recuperate from eating all that wonderful chocolate! Friday, January 19, at 7 p.m will be the first monthly open-microphone night for 2007. So, come take CENTER STAGE! It's free to perform and free to attend. This open-mic nite provides an opportunity for amateur performers, professional entertainers, or anyone who'd like to entertain, gain stage experience or just have a good time. You are welcome to use the excellent, well-tuned piano on stage or bring your own guitars, banjos, tamborines and other instruments. Local residents and out-of-state visitors are amazed at the array of talent performing here each month. OHAC is a non-profit organization sharing the cultural, musical and historical heritage of the Ozarks region. January is a perfect time to visit this animal lover's paradise: Home to over 100 large animals rescued from destruction - including Lions, Tigers, Cougars, Leopards, Bears, Monkeys, Deer and Birds. Over the winter the sanctuary is less crowded with tourists. Every afternoon brings a rare opportunity to hear lions roaring at feeding time. Professional and advanced amateur photographers be sure to ask about setting up a "PhotoWild" session to photograph these magnificent Big Cats in a natural setting. All proceeds from the photo shoots will be directly applied to the Fence-A-Thon habitat fund, providing large free-range type habitats for more rescued animals. Bear Creek Log Cabins is fast becoming a favorite family lodging headquarters for exploring wildlife and the great outdoors throughout North West Arkansas and South West Missouri. Explore rarely seen underground wonders in pristine, UNDEVELOPED areas of Blanchard Springs Caverns. These tours are safe for beginning cavers, but still fascinating for experienced spielunkers. Great caving experience for children over 10 years old accompanied by adults. January and February are perfect for family spielunking adventures since temperatures in the caves stay around 58 degrees Farenheit no matter how cold and windy it may be on the surface. All cave explorers need to be in good physical condition and prepared to get dirty as you climb and crawl into areas tamer "Tourist Tours" never get to see. Call 888-757-2246 (toll-free) for information and to make reservations. Reservations are absolutely required. So are long pants and sturdy boots. Don't delay. Tours to the wild portions of Blanchard Springs are not available after March 1. These world famous caverns are just a pleasant scenic drive from Bear Creek Log Cabins through beautiful Buffalo River country. Tim Ernst, known as Arkansas' Wilderness Photographer, presents two all new slide shows plus live question/answer dialog with digital photography students and outdoor enthusiasts. Buffalo River Dreams, a coffee table picture book, and Arkansas' Nature Lover's Guide are both featured in this rare live presentation. Tim's other books include Ozark Highland Trail Guide, Buffalo River Hiking Trails, Arkansas Hiking Trails, Ouachita Trail Guide, and Arkansas Waterfalls Guidebook. His photographs have appeared in Sierra Club and Hallmark calendars as well as National Geographic, American Hiker, Outdoors, Backpacker, Outside, and Arkansas Times magazines. The National Park Service and the Harrison Convention and Visitors Bureau are sponsoring this program at the Lyric Theatre on the square in Harrison. Free Admission Friday, Dec 1, 2006 at 7:30 pm. phone 870-391-3504 or email ozarkartscouncil@alltel.net for more information. Bear Creek Log Cabins now accepts well-behaved pets. Many families like to take their companion animals with them whenever they travel. Dogs love the freedom of our wide open spaces. Even senior dogs play like puppies again in the fresh air here. Cats enjoy all the sights and sounds and smells of the woods, but most don't go adventuring very far from the cabins. They prefer the safety of our big screened porches. Please let us know when you make your reservation what kind of pet or pets will be traveling with you. You are welcome to bring your own horses for trail-riding on our 500+ acres of trails, meadows and woods. Horses can stay in our open corral for no additional charge. So, Check out our low rates and give us a call at 870-448-5926. New Year's Holiday week-end is filling up fast, so make plans now for your New Year's Eve party or family reunion. Giclee Collector Art Prints by Bill Limbaugh Numerous original paintings, acrylics, watercolors and other artwork by award winning Illinois artist, Bill Limbaugh are on exhibit in the Art Gallery during the month of November. The Gallery is open Tues - Saturday from 10 - 4. Admission is FREE. Housed in an historic stone building constructed by the WPA in 1938, the Center shares the rich historical, musical and cultural heritage of Searcy County and the Ozark Mountains. Don't miss the chance to see this 1930's era building when you stop by to visit with Bill Limbaugh, noted Artist and Art Director from the Chicago area. Special artist's reception on Saturday, Nov 11 (Veterans' Day) from 2 - 4 pm. Our log cabin resort is just a pleasant scenic drive from Eureka Springs. ATTENTION PHOTOGRAPHERS: Mark November 19, 2006 on your calendar! And call NOW for reservations! A rare and special opportunity to photograph the wonderful upper level of Blanchard Springs Caverns near Mountain View Arkansas and the Ozark Folk Center. Tours meet at the Visitor Center at noon and will photograph for four hours. Tripods welcome; not an instructional tour. Light sweater or jacket recommended. Call (870) 757-2211 or (888) 757-2246 for rates and/or reservations.